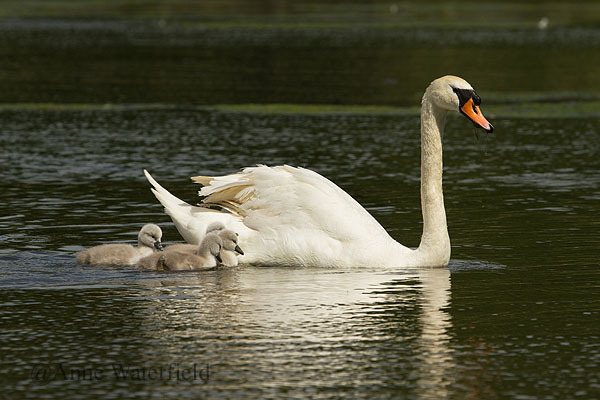 June 27th 2015, I am watching Long Neck and his vigorous bathing and out comes Little MIss with 4 new Cygnets. I know it's their first outing and she brings them over to me but is nervous about being close to the bank, so I am relieved when she takes them back out on the water. Within the week she is down to 2 and the following week they are all gone. Predation is always a big problem and having seen several American Mink it is possible they raid the islands at will, so along with Crows & Pike it becomes increasingly difficult to keep them safe. So no parental duties this year but that hasn't stopped Little Miss on her quest to secure her territory.